with advanced (metastatic) disease at time of diagnosis. sponse rate and limited tolerability for many patients. therapies are not suitable, therapeutic options are limited. *Financial support was received from Bayer Schering Pharma. ard ratio = 0.40; 95% confidence interval: 0.40-0.55). diarrhea, rash, alopecia and hand-foot skin reaction . 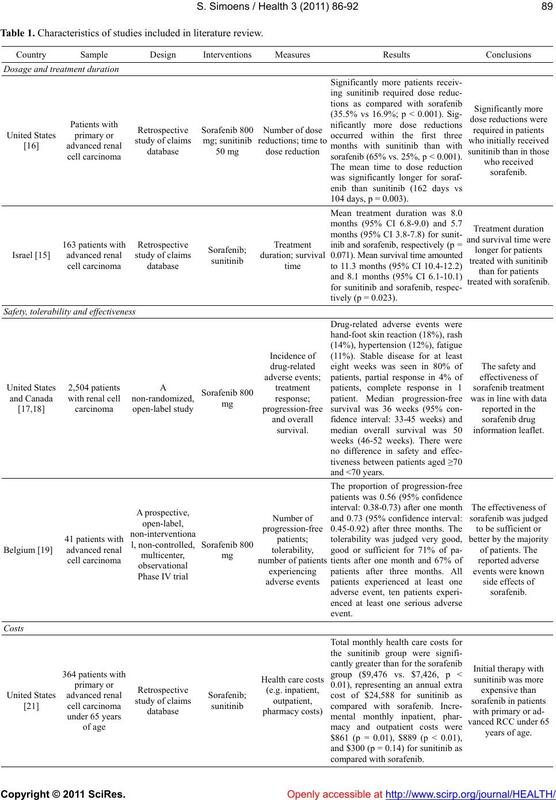 “ideal trial conditions” has been extensively studied. ability, dosage and administration of sorafenib [10-12]. 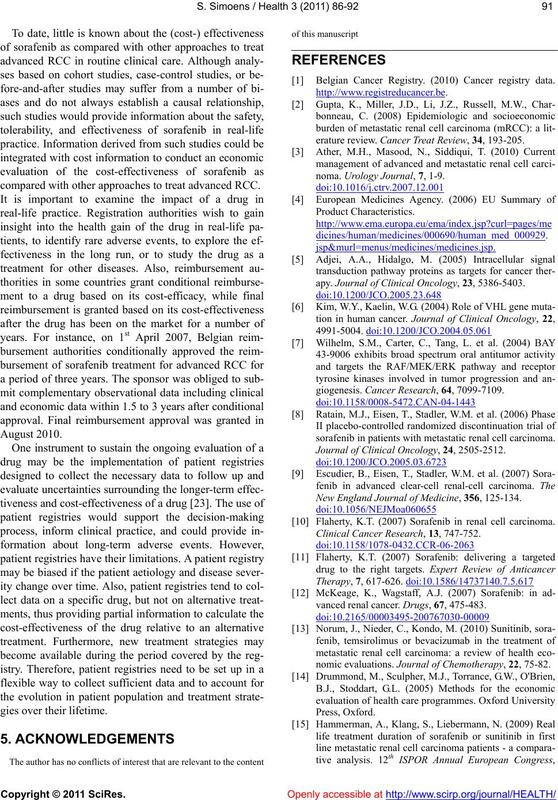 ciety of Pharmacoeconomics and Outcomes Research. cellular carcinoma) fell outside the scope of this study. of advanced RCC with sorafenib in real-life practice. lish, French, Dutch, or German for practical reasons. teristics of included studies are presented in Table 1.
sunitinib than with sorafenib (65% vs. 25%, p < 0.001). than in those who received sorafenib. receiving sunitinib and 29 patients receiving sorafenib. enib between patients aged ≥70 and <70 years . Table 1. Characteristics of studies included in literature review. sorafenib (65% vs. 25%, p < 0.001). 104 days, p = 0.003). inib, respectively (p < 0.05). 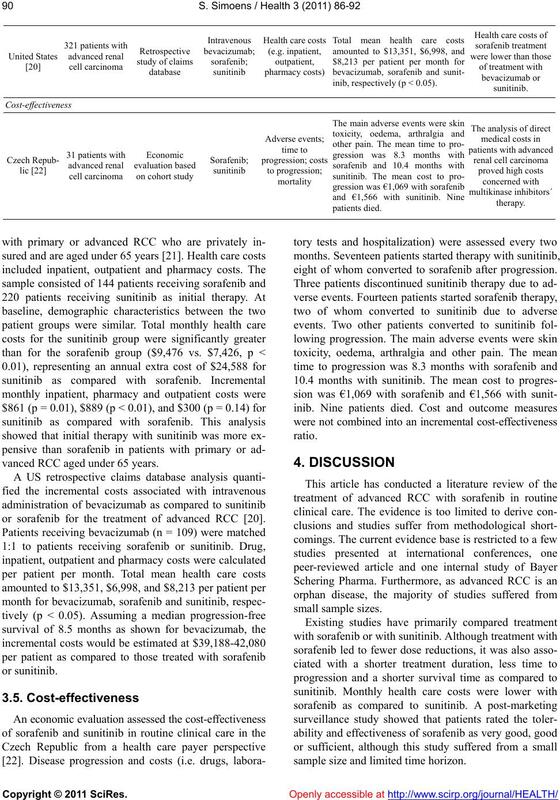 vanced RCC aged under 65 years. 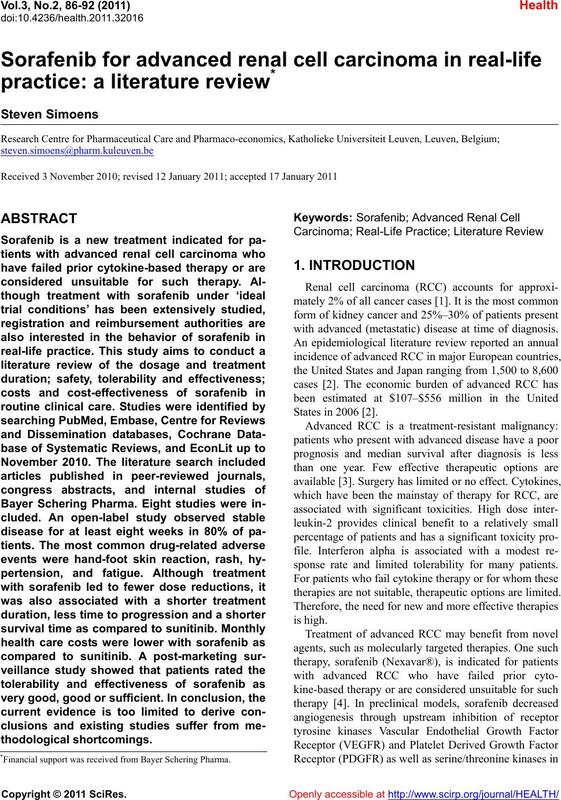 or sorafenib for the treatment of advanced RCC . eight of whom converted to sorafenib after progression. sample size and limited time horizon. compared with other approaches to treat advanced RCC. Belgian Cancer Registry. (2010) Cancer registry data. erature review. Cancer Treat Review, 34, 193-205.
noma. Urology Journal, 7, 1-9.
apy. Journal of Clinical Oncology, 23, 5386-5403.
giogenesis. Cancer Research, 64, 7099-7109.
sorafenib in patients with metastatic renal cell carcinoma. 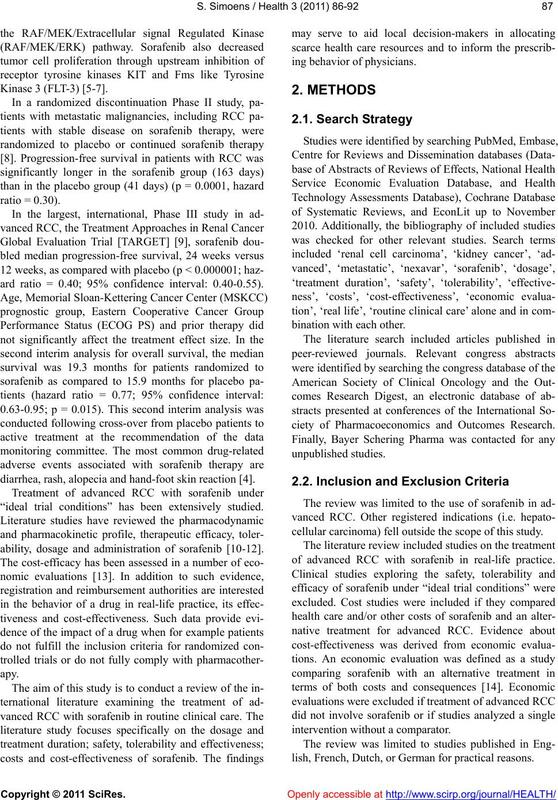 Journal of Clinical Oncology, 24, 2505-2512. New England Journal of Medicine, 356, 125-134. Flaherty, K.T. (2007) Sorafenib in renal cell carcinoma. 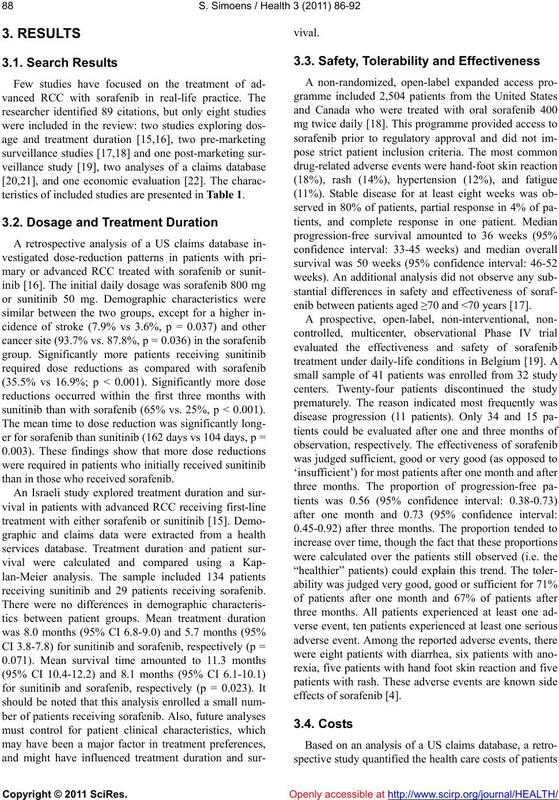 Clinical Cancer Research, 13, 747-752.
vanced renal cancer. Drugs, 67, 475-483.
nomic evaluations. 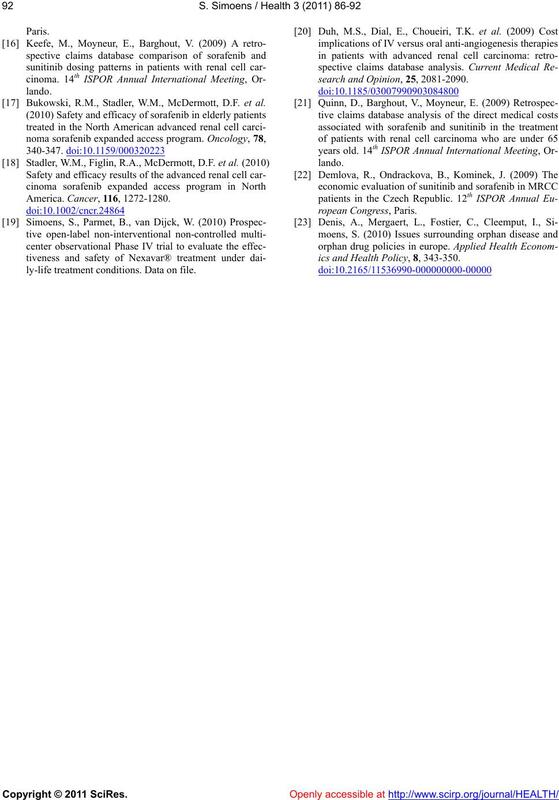 Journal of Chemotherapy, 22, 75-82. Bukowski, R.M., Stadler, W.M., McDermott, D.F. et al. ly-life treatment conditions. Data on file. search and Opinion, 25, 2081-2090.
ics and Health Policy, 8, 343-350.